Fall in love with every step. Irresistible style comes from the sweetheart topline and luxurious faux fur trim, but plush comfort is what keeps you coming back for more. Super cute and VERY warm! 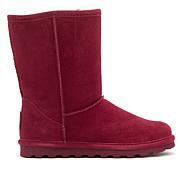 Love these boots, very cozy warm. Size runs a little snug. Gotten many compliments and I've only worn three times, lol. I originally ordered this boot in my normal size which is a 6. They were beyond tight, so sent back & got the 7. If you as readers could see my feet you would note they are small & very bony, no fat. Consequently, I was surprised at the fit. Also on the left foot, the ankle area is very tight. Again, I have very small ankles. Have not worn much as we haven't had any recent snow in our area. Ordered for my mother as a Christmas Present. Was so pleased with the overall look, but runs very, very small. We have never had an issue with this brand before till this style. She couldn't even get her foot in the boot. Was very disappointed and upset that I did not receive a full refund after returning, feel like this is a flaw in making and style of boot and I should have received a full refund. Could not get my foot in the boot. 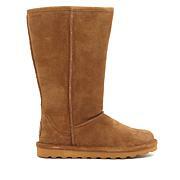 I have 2 other styles of tall Bearpaws and no problem. Needless to say I had to return them. 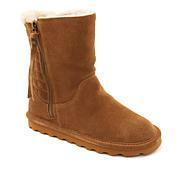 BEARPAW Shelby Suede Belted Boot with NeverWet Warm up your look with this belted boot. Perfect for traipsing around town or in nature, this rustic suede boot comes pre-treated with Rust-Oleum® NeverWet, a superhydrophobic technology offering protection from rain, ice, mud — even accidental spills.